If you are selling multiple products on your WooCommerce store, there are situations when you might want to see a list of all the customers that have ordered a particular product. Maybe there was a recall of the product and you would like to email all your WooCommerce customers to inform them about this. Or maybe there is a newer version of the product and you want to inform all the owners of the older version, that they can now upgrade. Whatever the reason might be, the Users Insights WordPress plugin makes it easy to get this information from your store. The WooCommerce module of Users Insights adds a “Ordered products” filter that is specifically designed to give you the option to segment your WordPress users by the products that they have purchased. Once you have the WooCommerce module activated, all you need to do is add a filter “Ordered products include” and select the product from the list. 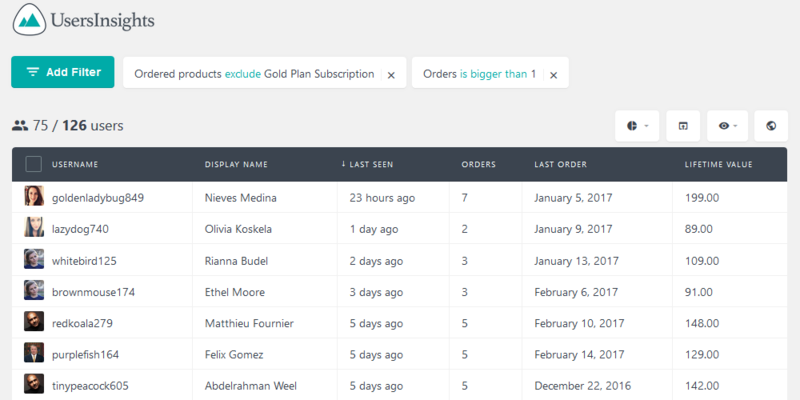 The “ordered products” filter will display a list of all of your WooCommerce customers that have ordered a certain product. If you want to get a list of all the customers who haven’t ordered a particular product, you can choose the “exclude” option instead. 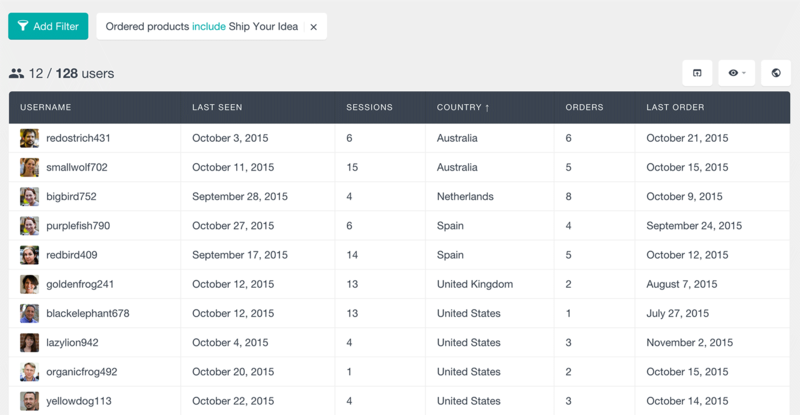 Since you can add multiple filters at once, you can create more advanced segmentation of your WooCommerce data. For example, by adding one extra filter, you can see all the WooCommerce customers who have bought two different products. This might give you an insight that many of the customers who have bought one product have also bought a second one. Then maybe it is a good idea to bundle the two products together or offer a discount for the second one. In order to find a list of all the WooCommerce customers that have purchased one product, but haven’t purchased another, all you need to do is to add one filter “Ordered products include first product” and second filter “Ordered products exclude second product”. But let’s go beyond the simple filtering options. You can allow WooCommerce personalized product recommendations by checking past orders and the customer profile. For example, customers with a high lifetime value and who bought a certain product may be interested in complementary products or upgrades. You could also apply the same logic to other fields. Customers who bought multiple times are even more likely to buy again from you. By analyzing your customer data you can get a good idea about what kind of products people usually buy together. Therefore, you may want to look for customers who haven’t bought a certain product but have bought multiple related products in the past. In this way, when you know that your customers are already interested in this type of product, it is very likely that they might be interested in purchasing a related one. You can repeat this process by adding multiple products in the negation filter so you can recommend related products that your customers haven’t bought yet. Once you have filtered the user list, you can import this list to your favourite email service, such as MailChimp or CampaignMonito. In this way you can create your own custom email campaigns, so that you can send these customers a special offer to incentivize a purchase.